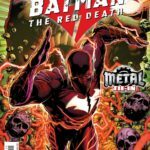 DC has posted the official five-page preview for Batman: the Red Death #1, and you can see it at CBR. It features the Flash and Batman of Earth-52…and things aren’t going well between them. The issue will be out this Wednesday, and it ties in with the Dark Nights: Metal series. This entry was posted in Flash News and tagged Preview on September 18, 2017 by Lia.